I don't understand why Fr James Martin SJ cannot accept being disinvited to speaking engagements with the same graciousness, understanding and humility as His Eminence Cardinal Raymond Burke, who is often considered 'too hot to handle' and finds himself for some reason being told that a venue or Diocese is not prepared to host him, yes him, a Cardinal no less, who has no problem with being called and treated as a Successor of the Apostles. I hear that he is most gracious when his speaking engagements are pulled for no apparent reason and with little in the way of justification. I do feel sorry in a way for Fr James Martin because clearly there is nobody to shepherd him and reign him in so that he does not set himself up for such public disappointment and the attending histrionics that follow being regarded as somewhat scandalous to the faithful. Does he not have a superior somewhere? Wherever you are, you could really help this Jesuit priest! Here is a musical take on the recurring aviation fiascos so regularly embraced by Pope Francis. Happy Feast of St Francis de Sales, patron of journalists, may he intercede for Catholic writers, journalists and bloggers across the world. May we proclaim our Lord Jesus Christ in season and out of season and oppose any and all attempts to subvert His Teachings inside the Church. Because it made such a headline, I immediately thought - as I made apparent in my last post - that Pope Francis had gone and done something that was controversial, that would serve to generate a great deal of publicity and would ensure that such publicity would serve to benefit himself but few others, including Christ our Lord. Fr Thomas Weinandy into this song. A stranger pontificate in history shall likely never be found. More bloody pontificates? More violent pontificates? More corrupt pontificates? More edifying and glorious pontificates? Yes to all these, but the award for strangest pontificate shall surely go to Francis. Everything about this papacy has been strange, confusing and unsettling, disturbing and worrying. I liked that description from the bishops of Kazakhstan - 'alien'.Yes, much of this pontificate has been foreign and 'alien' to Catholic sensibility, to Catholic feeling and to Catholic tradition. 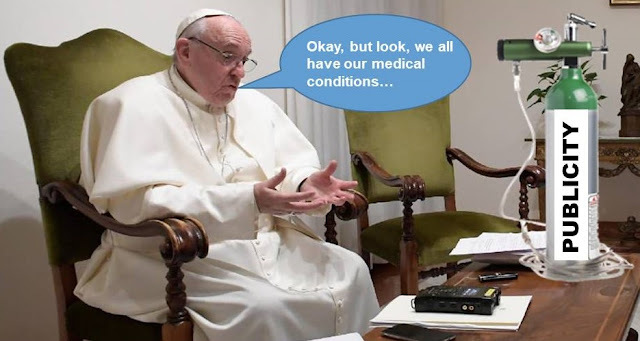 Jorge Mario Bergoglio sidled into the Seat of Peter with astonishing confidence and he lost no time in laying out the scope of his radical agenda still unfolding in real time. Clearly nothing in the same room as him is to be marked safe.